There are few things in life (if any) that are more enjoyable than cruising on the ocean, while relaxing on a luxurious Yacht. You don't need to be rich to experience a beautiful day or a star studded evening with family and friends. These are wonderful experiences and should be enjoyed by everyone… even if for a short time. By renting or chartering a motor or sailing Yacht you can experience the pleasure without the pains or responsibly of owning a Yacht. 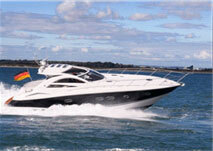 We are now offering Yacht Charter packages available to all, regardless of age or time available.